Does anyone else feel like a carnation is the white trash of flowers? They happen to be my mother's favorite, yet I've never felt a love for these little lovelies. Worst. Flower. Ever. They make me sneeze so much, and they are my Mom's fav too. I'm with you. A poor man's solution to bringing a girl flowers. I actually LOVE carnations. I know, I have never met a person who likes them either. My favorite are white carnations. But this is why: when my dad was a young adult he took dozens of white carnations to down town San Fransisco and handed them to people living on the street and said to each of them "God loves you." When I first heard that story, and the people's reactions to my father doing that I always got the chills. Since then I have, myself, done the same thing with dozens of carnations a few times and it has been amazing. That being said, it could have been done with any flower, but because it was a carnation I link carnations to this beautiful story and since then I love to get them and they smell beautiful to me. I think getting flowers can be as personal as a greeting card. Getting them period is wonderful, that one thought of you enough to get you some cheap or not, is so sweet. But if you get one that is specific to you, even better. I guess since I love carnations, I am just saving the one I fancy lots of money in the future :). In short. I love carnations. I like carnations because they've frequented some very special occasions to me and they bring by those memories. I prefer other flowers, but I don't understand others' hate of the flower. Besides, I'd rather be given a thoughtful carnation than a thoughtless rose. Love bleeds on the outside? It depends. I think they are pretty when they are added into CERTAIN floral arrangements. The science-experiment, water dyed version however? Total white trash. Whoa whoa - I never said I'd look down on someone for giving me a carnation! I love receiving flowers, no matter what they are. I just think carnations are not as classy as others. It is the thought that counts, although I would prefer others. That being said, holy cow, Jersey! 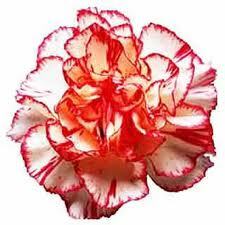 I don't think I will ever again be able to see a carnation without thinking about unconditional love. W-O-W.